Here's a highly accessible, dependable source of guidance on the analysis of the hemodynamic waveforms generated in the cardiac catheterization lab. It progresses from a review of basic monitoring principles and normal waveforms through an assessment of the waveform data associated with the full range of individual coronary diseases, providing you with all the assistance you need to accurately interpret any findings you might encounter in practice. 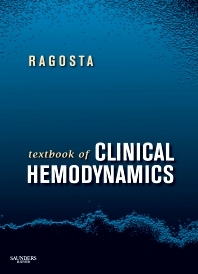 While many cardiac catheterization books cover hemodynamics, none offer the level of detail and visual back up that you'll find inside this book. Its extremely clinically oriented approach makes it an ideal hands-on tool for any clinician involved in diagnosing cardiac problems using interventional cardiology. Straightforward, richly illustrated explanations clarify even the most advanced interpretation concepts and skills. A useful overview of today's catheterization lab technology enables you to understand the latest advances in waveform acquisition. Thorough coverage of both normal and abnormal findings helps you distinguish normal waveforms from those indicative of disease. A disease-oriented assessment of waveform data demonstrates how both qualitative and quantitative interpretation can affect clinical decision making. Chapter 1. Introduction to Hemodynamic Assessment in the Cardiac Catheterization Laboratory. Michael Ragosta, M.D. Chapter 2. Normal Waveforms, Artifacts and Pitfalls. Michael Ragosta, M.D. Chapter 3. Cardiac Output and Shunt Determination. Vishal Aurora, M.D. Chapter 4. Mitral Valve Disease. Michael Ragosta, M.D. Chapter 5. Aortic Valve Disease. Michael Ragosta, M.D. Chapter 6. Hypertrophic Cardiomyopathy and Related Conditions. Michael Ragosta, M.D. Chapter 7. Right-Sided Heart Disorders: Hemodynamics of the Tricuspid and Pulmonic Valves and Pulmonary Hypertension. Michael Ragosta, M.D. Chapter 8. Pericardial Disease and Restrictive Cardiomyopathy. Michael Ragosta, M.D. Chapter 9. Chronic Heart Failure and Shock. Michael Ragosta, M.D. Chapter 10. Complications of Acute MI. Brandon Brown, M.D. Chapter 11. Congenital Heart Disease. Rajan Patel, M.D. and D. Scott Lim, M.D. Chapter 12. Coronary Hemodynamics. Michael Ragosta, M.D. Chapter 13. Advanced Hemodynamic Assessment of Ventricular Function. D. Scott Lim, M.D and Howard P. Gutgesell, M.D. Chapter 14. Miscellaneous Hemodynamic Conditions. Michael Ragosta, M.D.